A touchstone is a reference point from which other things can be evaluated. The work was inspired by the way people interact with their community and public park space. The work is meant to highlight how Wolfs Lane Park is a touchstone for the community. Wolert is creating two large-scale “Touchstones” that are intended for the participant to interact with by viewing and touching the textures. She is interested in how the reflective nature of the beads will engage with the existing natural elements and the changing light. 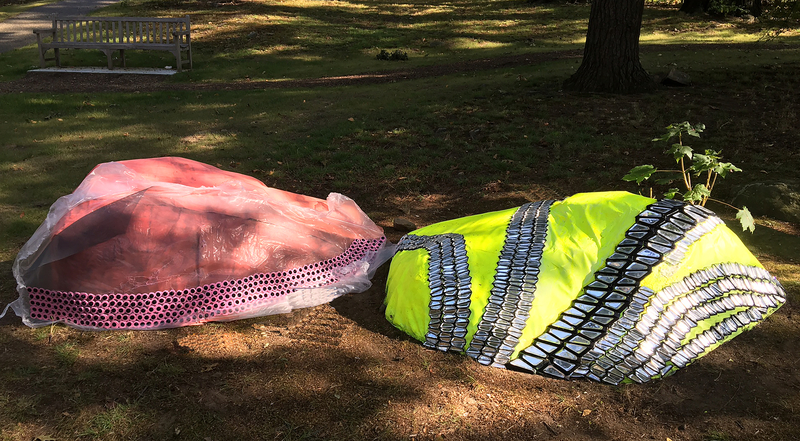 The colors will be in dialogue with the changing seasons; the surface will change over time; the public will engage and refer back to the stones once the sculptures are removed and the memory of the installation will serve as another form of touchstone. Beatrice Wolert is the Owner of Bea Wolert Studio, LLC. She is a first generation Polish American visual artist raised in Greenpoint, Brooklyn where she continues to live and maintain her studio practice. Wolert works between genres to explore concepts of impermanence, essentiality and serendipity through the transformation of everyday materials and found objects. She holds a BA in Design from Adelphi University and an MFA in Painting from Pratt Institute. Wolert has exhibited her work at venues such as The Active Space, A.I.R. Gallery, Artists Space, Bartow-Pell Mansion Museum, Denise Bibro, HQ, D.U.M.B.O. Art Center, Exit Art, Feature, Inc., Ground Floor Gallery, Lorimoto, NURTUREart, Trestle Project Space in New York, Woman Made Gallery in Chicago, BLAM Projects in Los Angeles, CA, Helmuth Projects, San Diego, CA, and internationally at the Aratoi Wairarapa Museum of Art and History in New Zealand. She has given numerous artist talks, partook in the Elizabeth Foundation for the Art’s shift residency, the Bridge Residency and was a member of One Stone Collective. Visit beawolert.com for more info.